This is the festive season for all mobile lovers who want handsets with powerful, feature boosted, sturdy, big display at an affordable price; because mobile Companies are these days launching their new devices for the money conscious buyers with so many features. [sch i=”description”c =”Recently, Lava has also joined the league with their latest offering Xolo A1000; an Android powered dual core, dual SIM capable of dual standby GSM/3G device along with 1GB RAM at the price tag of INR 13,990/-“]. It has direct rivals waiting in the market such as, Micromax Canvas HD, Karbonn S1 Titanium and Spice stellar Pinnacle MI 530. 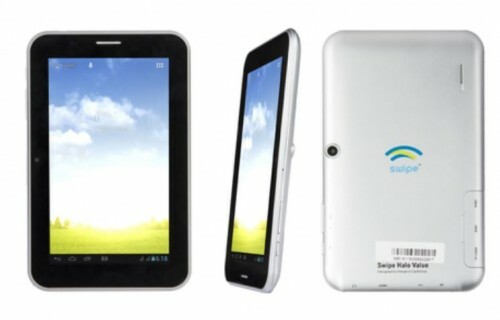 So, the question is – Is this a good business decision to launch a dual-core device at this time with the price range of Quad Core device available in Indian market by several competing companies? Now we are ready to give this new challenger a real tough time while judging its specs & features. To catch the attention of consumers at first sight, you need to design your product carefully with good material and quality and we assume that in this section Xolo A1000 scores well above the Micromax Canvas HD A116 and Spice MI 530. Xolo A1000 has an elegant & pure look with a good build, made of good plastic. The back cover seems like glossy with company’s logo stamped on it and having the rear 8 Megapixel camera with a small LED flash along with it. The external speaker is at the bottom of the back panel. The power button is housed on the right hand side panel of the device and the volume rocker & camera shortcut buttons can be found at left. We found it odd as design wise we all are familiar to have camera shortcut button on the right. The top panel houses the 3.5mm audio jack and a miniUSB port. The handset is sleek in design, not looks bulky, comes with a 5 inch display and you will see three touch sensitive buttons at the bottom of the display – Back, Home and Menu. On the top of the display you will discover the front 1.2 Megapixel VGA camera and the usual sensors. 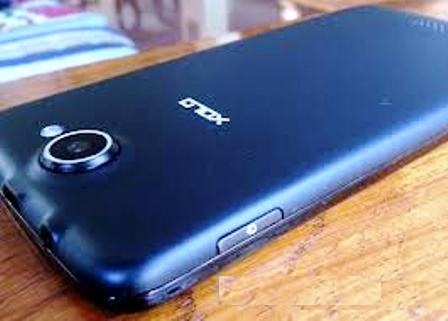 The dimension of Xolo A1000 is 70.8 x 143.5 x 8.8mm and the Company used a technology called “One Glass Solution” (OSG) to make this Smartphone slim. Xolo have claimed that it is not a ‘Phablet’ as one can easily hold the device in one hand and we found that most of the regular functions like swiping through menu, unlock to home screen, making calls etc can be done easily with one hand which is amazing. Under the back panel you will have the removable battery, 2 SIM slots and a microSD external card slot. The 8mm thin smartphone design is praiseworthy as these days all companies are busy making “huge budget mobile phones” and they don’t pay attention to the design & the thickness. Xolo A1000 is powered by MediaTek MT 6577 chipset Dual Core processor clocked @ 1GHz, 1GB RAM and PowerVR SGX 531 GPU with 21 million/sec Triangles per second. 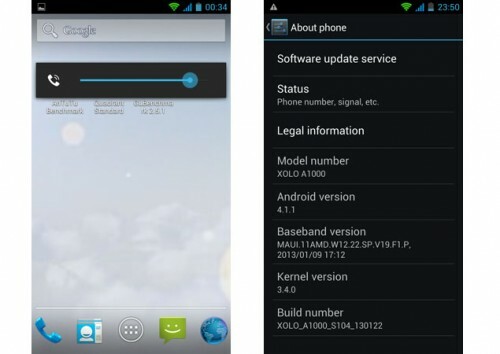 It comes with Android v4.1.2 Jelly Bean out of the box and can be updated to v4.2 Jelly Bean. 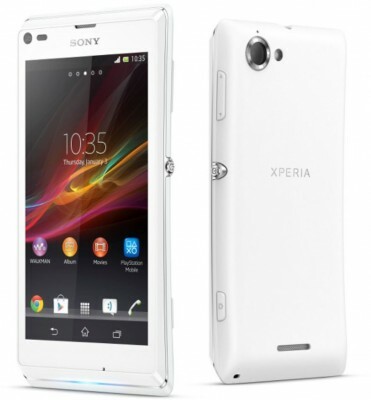 Its internal memory is 4GB that can be expanded up to 32GB using external microSD memory card. We found only two differences between Micromas Canvas HD and Xolo A1000 are the CPU & GPU; Micromax have used the lower Quad Core MediaTek MT 6589 CPU clocked @ 1.2 GHz and a PowerVR SGX 544 GPU. Otherwise, all other hardware specs and Operating system versions are same. 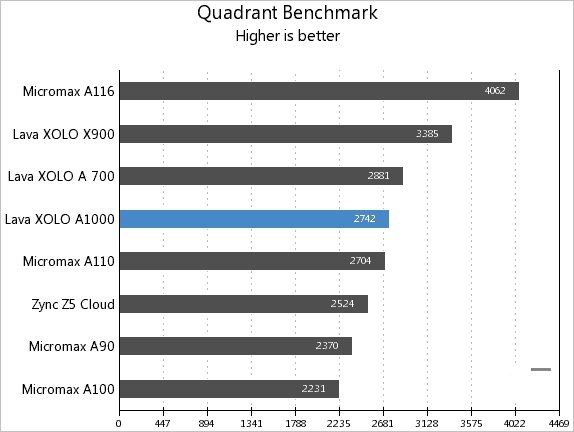 Here, we have Micromax Canvas HD A116 a clear winner in terms of CPU & GPU which are faster than the Xolo A1000’s hardware components. Xolo A1000 features a 5 inch HD capacitive IPS LCD touchscreen display with 1280 x 720 resolution (~295 ppi pixels per inch), 16 Million colors having OGS technology as we have already stated above. Viewing angles and under sun visibility is good. Both Micromax A116 and Xolo A1000 have the same display but Xolo comes with OTG technology which was already used in high end handsets like “LG Lte Optimus G & Nexus 4” that helps the display screen to produce more clear text, images and videos. 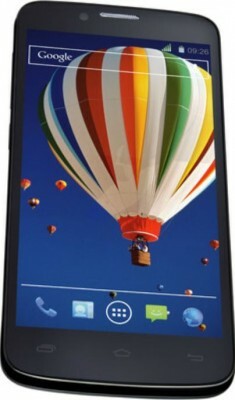 The screen has a thin protection layer to prevent regular minor scratches and touch sensibility & response time is great. To make A1000 handy, Xolo have increased the length rather than the breath hence it has a 5 inch display. In this section Xolo A1000 slightly scores more for its new OTG enabled display technology that gives sharper, crisp & vivid color display than Micromax A116. Now, the interesting part is the camera feature of Xolo A1000 that has an 8 Megapixel rear camera with autofocus, single LED flash, touch focus,4x digital zoom and a New BSI sensor that enhance the camera’s image capturing capability in low light condition or in the dark. 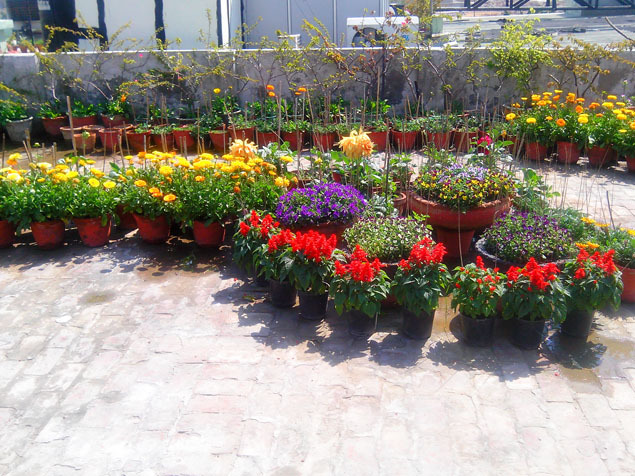 The image quality is impressive and we have seen visible difference while turned on the given ‘HDR’ mode. The front facing VGA 1.2 Megapixel camera is not a big offering and can come handy at the time of Video calling & chatting. The day light images quality of both Xolo A1000 and Micromax Canvas HD A116 are same; only in night time there is some difference as XOLO A1000 have BSI sensor which improves the image quality in poor light condition though Xolo A1000 have only single flash. Micromax A116 have a better 2 Megapixel front camera but the BSI sensor of XOLO A1000 is capable of taking decent snaps with the VGA front facing snapper. It is only capable of shooting 720p HD videos @30fps and clips are saved as .3gp format which is pretty much old fashioned. As Xolo A1000 and Micromax A116 both are budget Super phones, you cannot compare these two’s snaps with high end smartphones. In this cost the images are desirable. Having a 720p HD display, Xolo A1000 graphical display is vibrant. 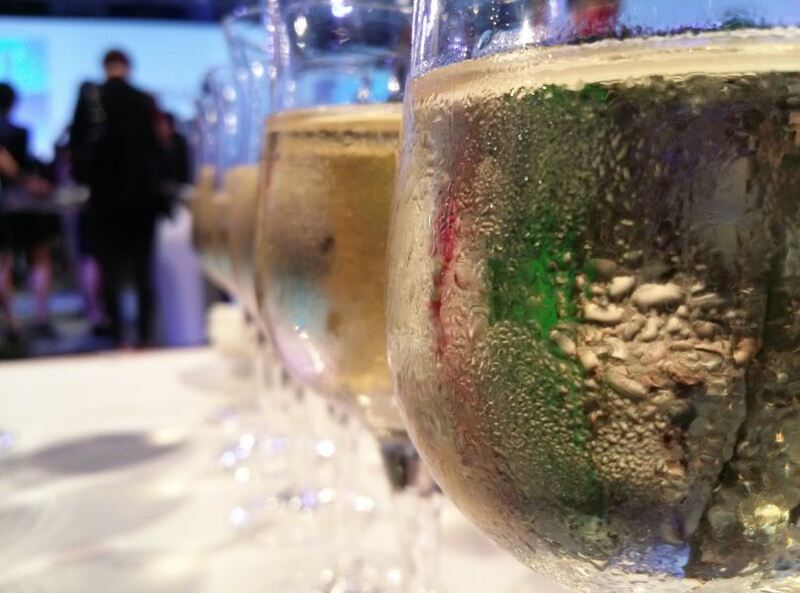 We have played 720p HD videos over 3G & Wi-Fi and found smooth rendering without any lag. Watching 720p HD videos on YouTube was also hassle free experience over high speed Wi-Fi network. We are disappointed as it can only play HD 720p videos which is a drawback as Micromax A116 & some other devices at this price are capable of recording and playing full HD 1080p videos. It only supports .3gp and Mpeg4 file format that means AVI file cannot be played. Touch sensibility and pinch to zoom in/out features worked perfectly while browsing internet on stock HTML browser, pager were opening fast in real time. It has a decent music player which is capable of playing all common music files and external speaker’s sound output is pretty loud. The headphone quality is average and our song listening experience was decent. You can play most recent games like Temple Run2, Dead Trigger, Fifa 2012 etc without any lag but installing big memory occupying games like Asphalt7, Nova3 etc. can be a problem as its internal memory is only 4GB of which there is a limited free memory space for users close to 2GB. This is also common with Micromax A116 and a big problem in terms of installing big apps or too many apps of your preference. Xolo A1000 also comes with FM transmitter. Xolo A1000 has stock Android Jelly Bean User Interface and that can have 5 home screens for customization with widgets & application shortcuts according to users’ preferences. It does not come with many pre-loaded applications; like other Xolo series phones A1000 has XOLO Care Application which can be helpful contacting XOLO customer care service by SMS, email or voice call. It comes with document viewer, ToDo app, Google Map, organiser, email support, IMs etc. you can download apps according to your need from Google Play. 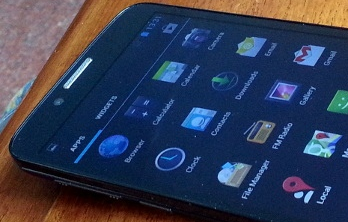 The Xolo A1000 supports Both GSM and 3G networks. It supports EDGE connectivity on GSM 900 & 1800 Mhz and 3G on WCDMA 2100 MHz band. Data communication speed through HSUPA 5.76 Mbps and HSDPA 7.2 Mbps, which is lower than Micromax Canvas HD A116 having HSUPA 11 Mbps and HSDPA 21 Mbps speed. A1000 also comes with Bluetooth v4.0, USB v2.0, and Wi-Fi 802.11 b/g/n with hotspot support to share internet connection. We did not face any voice distortion while calling and speaker & mic did their job well, network signal was strong. It supports A-GPS which locked our location quickly. Xolo A1000 has Accelerometer sensor, Proximity sensor and Ambient light sensor. It has a removable 2100 mAh Li-ion battery under its hood which is little bit stronger than Micromax A116’s 2000 mAh Li-ion battery if compared. We had talk time up to 5 hrs and 3 hrs on GSM & 3G network, respectively. Xolo A1000 lasted a day long with heavy usage which is impressive during our test. Its complete battery recharging time is 1-1.5 hrs via miniUSB port. Xolo A1000 is now available in two colors – White & Black. 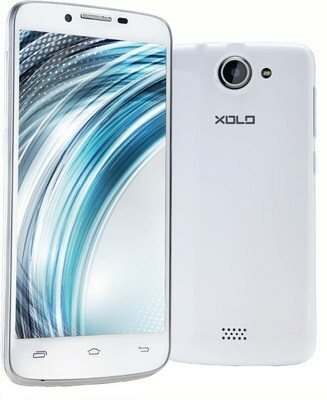 Like all other handsets, we did put Xolo A1000 under a lot of testing & benchmark software to measure its performance. On Quadrant benchmark it scored 2742 which is lower than Micromax A116’s scoring (4062). 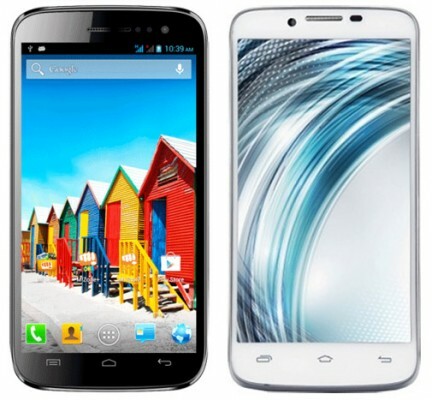 It is also significant that it came behind of its own Xolo brothers – Xolo X900 and Xolo A700. On Antutu Benchmark v2.9 it secured a total of 5453 which is again lower than Micromax A116’s scoring (9704). 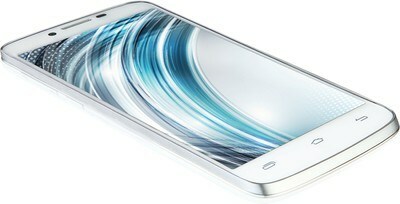 Again it came behind of Xolo X900 and Xolo A700. 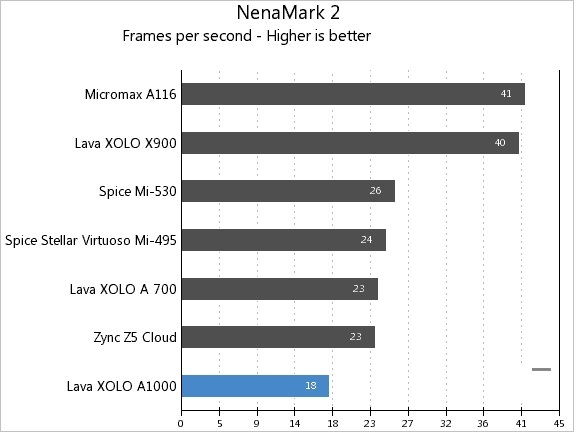 On Nenamark 2 benchmark it managed to clock just 18fps which is again shorter than A116’s scoring (41 fps) and secured score less than Xolo X900 and Xolo A700. The testing results definitely revealed its power and performance capability which is not even close to Micromax A116 or even not to its own xolo brothers. Verdict: If you are looking for a large screen android based handset with attractive sleek look, decent build quality, good display and strong battery then you can go for the Xolo A1000 at the price tag of INR 13,999/-. Otherwise, you can have many choices at this price range and you can have same Dual Core based handsets under INR 10,000/-. If you count on us, then our recommendation will be Micromax Canvas HD A116 having a Quad Core 1.2 Ghz CPU & a better GPU and capable of shooting or playing Full HD 1080p videos at the same price. We are really disappointed with Xolo’s strategy for launching a Dual Core 1 Ghz powered handset even not having Full HD video handling features with minimum file reading support. 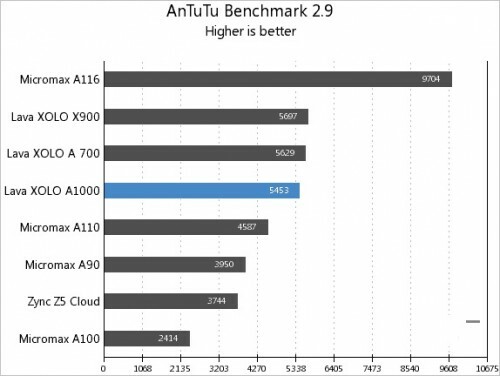 The performance is not up to the mark also for a Dual Core device; while benchmark testing Xolo A700 with same hardware specification comes above of Xolo A1000. Then why have they aunched a device that cannot even compete with their old device having the same specs? 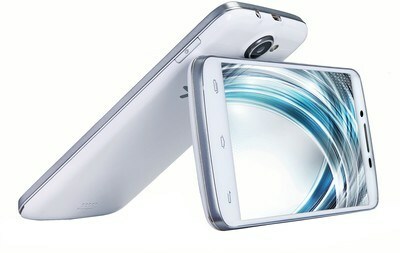 Just for a 5 Inch display the company launched a device at the same price tag of Micromax A116. The good things that the handset comes with are: its good display (OGS technology) & sleek design and rear 8 Megapixel camera with BSI. Rating: From our point of view, [sch i=”itemReviewed” c=”Lava Xolo A1000 phone”] is not a value for money buy and our rating is [sch i=”reviewRating” c=”2.8″] out of 5. – Review by [sch i=”author” c=”Shubhrajit Chakraborty”]. I have encountered some problems with my GPS. Any help at that end ? I wanted to go for q800 of xolo which is a better phone at lower price range. However I would like to tell you xolo a1000 can record full 1080p videos and play the same ! I recorded a video form my phone and played in my computer its full hd and vice versa.No problems in playing videos section. However gaming remains a problem on this phone acc to me due to such poor benchmarks. Do you think it can run Nova 3 ? Xolo q800 can run the game easily ! Don’t forget to read the comments section for experience from real buyers, if any!